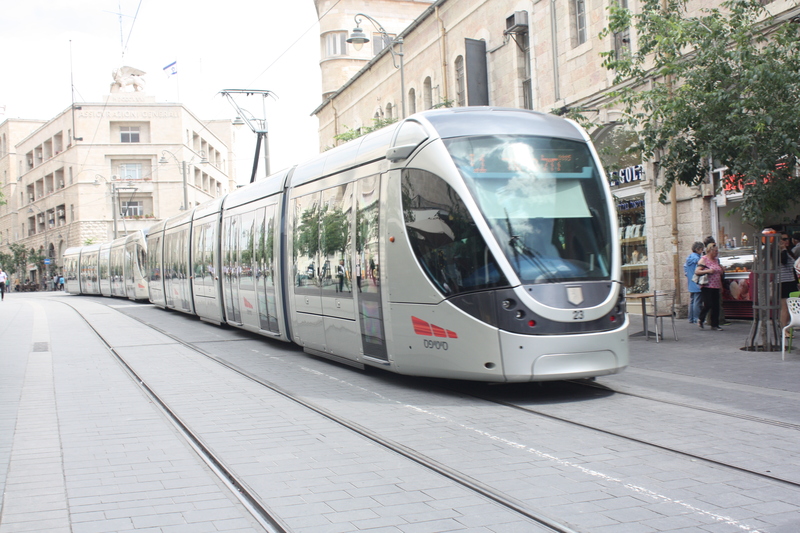 Jerusalem Light Rail – shared space or waste of space? 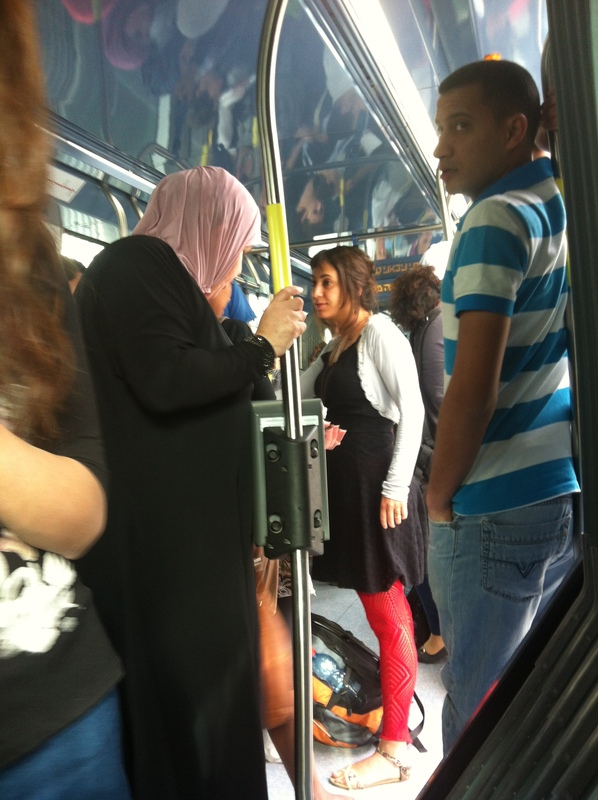 Jerusalem’s new tram system has received a lot of mixed reactions. 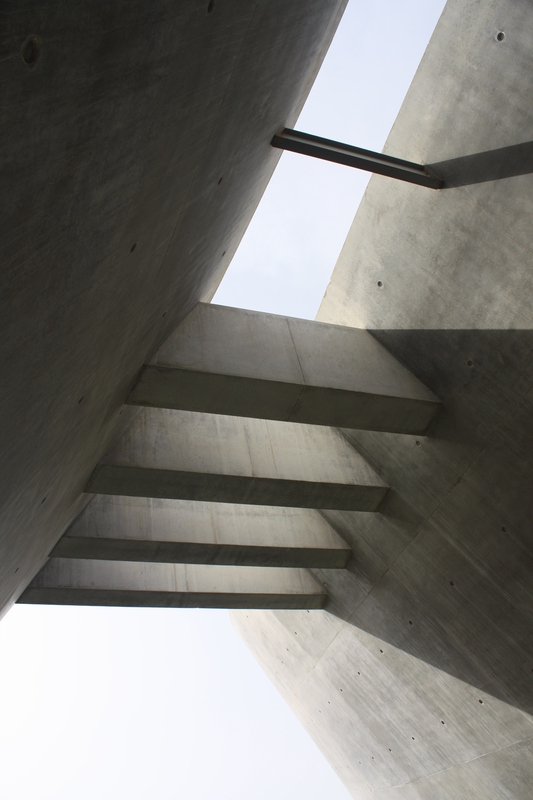 I had read about the controversy surrounding it before coming here and was keen to see what people within the architecture and planning worlds made of it. I have been using it regularly, to travel to and from the Central bus station when I don’t feel like walking (or am running late!) 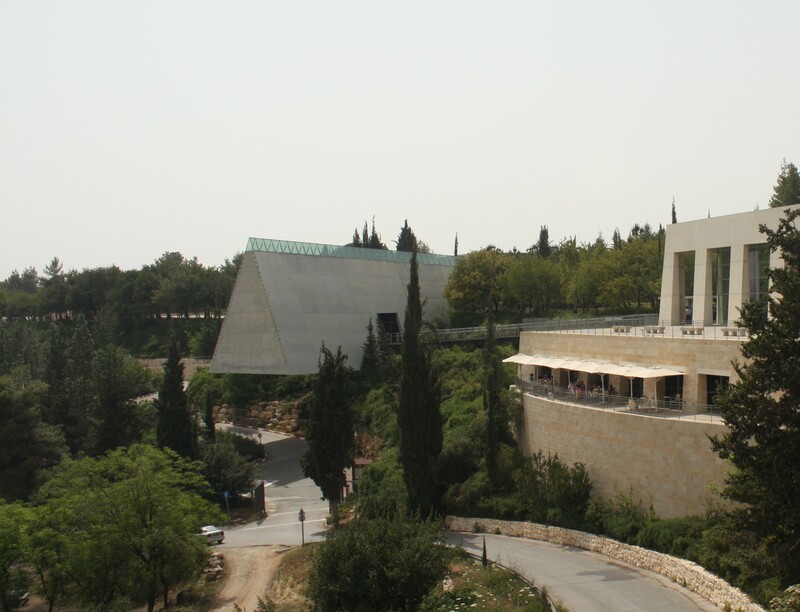 and to travel to Yad Vashem, the dramatic hilltop Holocaust memorial and museum at the southern terminus of the line. Visitors weave their way through the exhibits, intermittently crossing and re-crossing this triangular cavern before bursting out at the other side to behold a spectacular view of the Jerusalem hills. The route of the line is controversial because its northern portion travels through East Jerusalem (occupied territory) to reach Jewish settlement towns there. In so doing, it also passes through some Arab villages. It also travels for a time along the seamline north from the Damascus Gate, which some argue concretizes that line as a divide between the two sides. Only one line has been built, but plans are underway to build more over the coming years. The tramline travels the length of Jaffa Road, which is the Western City’s main shopping street. I’m told this road used to be bumper-to-bumper with buses and their incessant horn-tooting. Now all of those buses have been rerouted to the surrounding roads, which tend to be more residential in nature. The project’s detractors say this has had a bad effect on congestion on these roads, that is was all excessively expensive and that the ten year construction period caused many local businesses along this road to suffer. 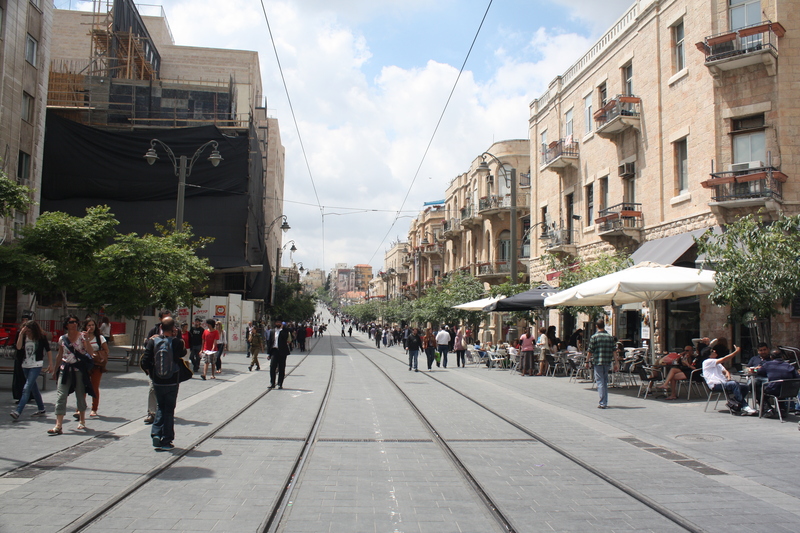 Jaffa Road is now a fully pedestrianized, generously proportioned and attractively paved street with the occasional tram passing along the middle. There are numerous cafes, bars and ice-cream haunts with al fresco tables which are great for people watching. 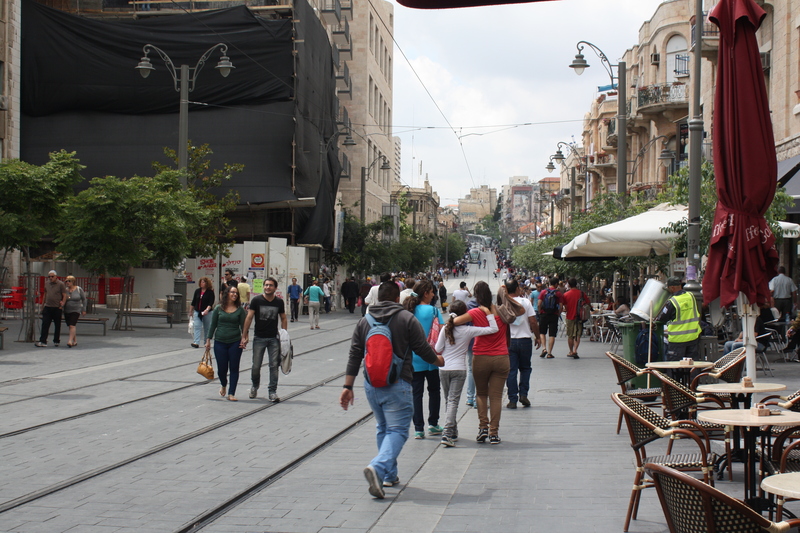 You couldn’t fail to be impressed by pedestrianized Jaffa Street. And so I started thinking that if it was a choice between this and non-stop buses, this was by far preferable. But one of the architects I spoke to, Hillel Schocken, described a very convincing alternative that has been implemented in South America, using electric buses that could come with all the same advantages (platforms for level access, quietness, tickets purchased on the platform to save time, road closed to other traffic) but at considerably less cost and disruption. So the expensive Light Rail wasn’t the only way in which the city’s public transport system could have been improved. 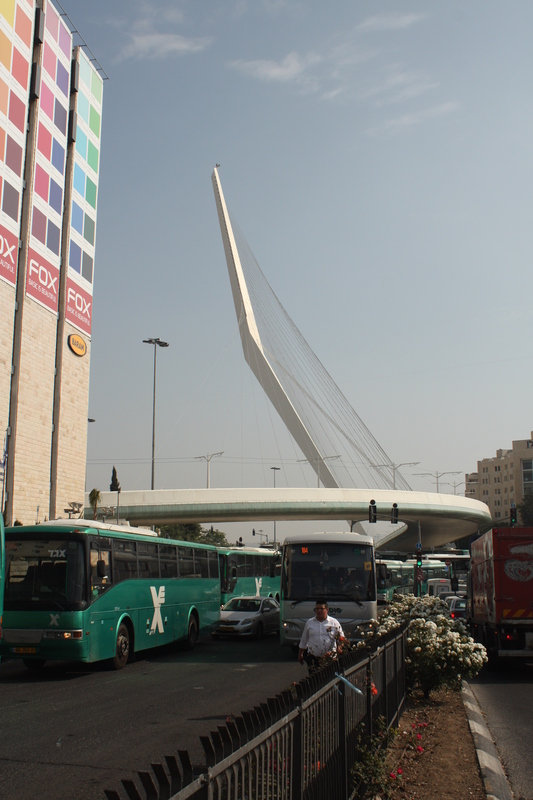 And of course electric buses, which don’t require the laying of tram lines, wouldn’t have been quite so inflammatory in East Jerusalem, or quite such a symbolic move towards reunifying the divided city. 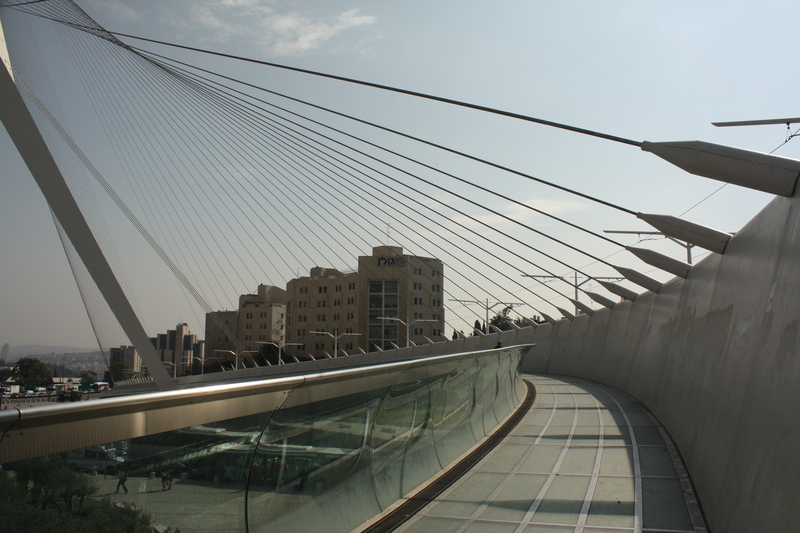 The tramline also boasts a bridge by Santiago Calatrava, designer of ‘the Harp’ (or Samuel Beckett Bridge) in Dublin and countless other sculptural, white, cable-stay suspension bridges in his native Spain and across the world. Unlike many of his other bridges, though, this one doesn’t cross a scenic river or a dramatic landscape – it crosses a road junction. People have complained that you can’t even get a proper, full view of from anywhere. Having been to photograph it myself, I have to agree – and there’s something a little jarring about something so elegant sailing over ugly, mundane roads and cars. 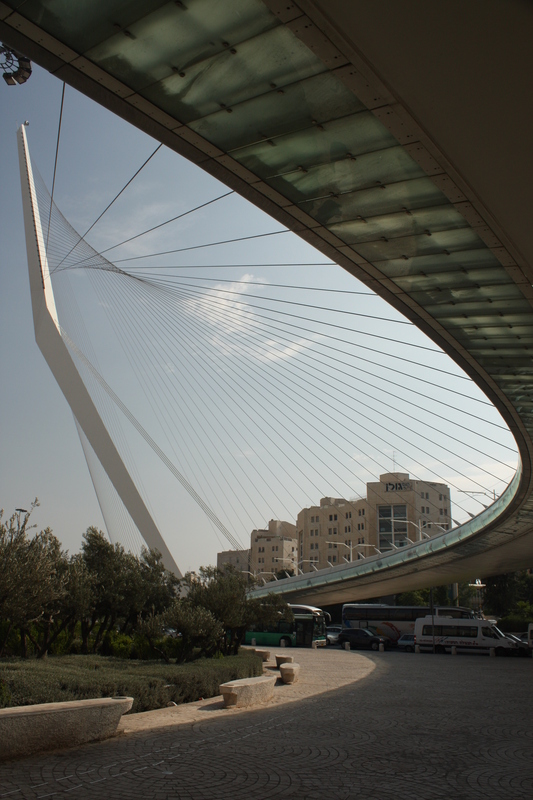 The other common criticism is that Jerusalem had enough impressive old stuff and architecture to draw people to the city as it was, and there was really no need to add a bit of Calatrava bling to its outskirts, again at considerable expense. The trams themselves are slick , modern, air conditioned…and bomb-proof (ie. the if a bomb goes off on it, the explosion is contained – doesn’t bear thinking about too much!). I walked past the aftermath of a collision between one of the trams and a car – the car was a crumpled mess (noone seemed to have been injured, thankfully) and the tram had barely a nick on it. 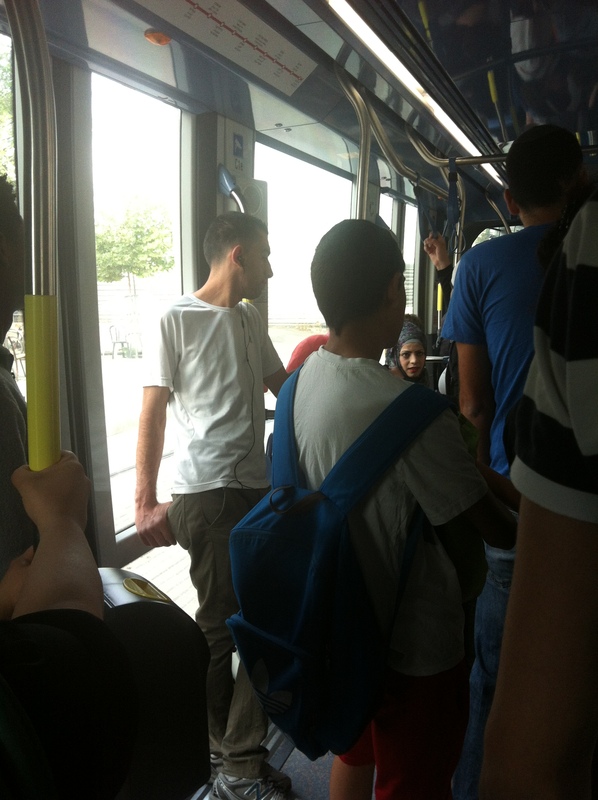 Because the trams travel through Jewish and Arab areas alike, you get a mix of local residents using the tram side by side. This prompted me to wonder if the trams might then be considered one of the city’s shared spaces. Having spent quite a bit of time on these trams over the past weeks I would conclude that they are shared only in the loosest of senses, whereby different groups may be in the same space at the same time but still have minimal interaction with one another, which is a phenomenon some might say it shares with the public spaces of Belfast.